5 switched 10/100 Mbps ports. Auto-speed and duplex mode sensing. Versatile and compatible. 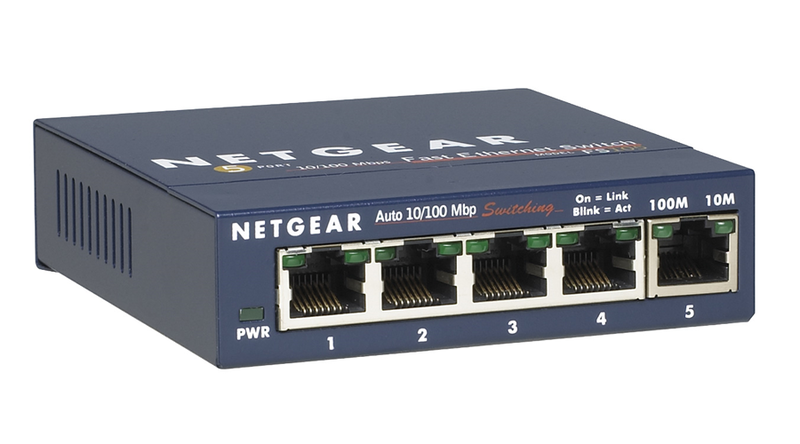 NETGEAR's popular FS100 series desktop switches, known for its reliability and performance, provide your LAN with high-speed, 10/100 Mbps auto-sensing connectivity for as many as 5, 8, or 16 users. Just plug in your Ethernet cables, connect a power cord, and you're ready to go-there's no software to configure. They negotiate to the fastest possible connection and with Auto Uplink™ technology, these switches automatically figure out if the link needs a straightthrough or cross-over connection, and makes the right choice. Existing 10BASE-T devices are easily integrated within higher bandwidth environments, with full wire speeds on all ports of either 10 Mbps or 100 Mbps. Engineered without the need for internal fans, they operate silently. And each of these very compact switches is housed in a sturdy metal case for years of dependable use. When you want solid network performance for your growing business, plus the added benefit of quiet operation, NETGEAR's ProSafe FS105, FS108, and FS116 are your best choices for quality, convenience, and smooth - running usability - all at very affordable prices.